I arrived in Copenhagen for a short 24 Hours press trip with Visit Denmark and was greeted by Erik from Visit Denmark and my colleague Kim who arrived early noon and had some time already to explore the city. Luckily, it wasn’t my first time in Copenhagen, so the short and condensed time for all the activities we had planned ahead didn’t make me nervous, in contrary; the agenda was packed with new and exciting activities to showcase the latest openings in the city which we were eager to explore the following day. Back in 2014 I was in Copenhagen for the #BeeSustain Tweet Tour and a few months later the same year I was back for the #MIND fam trip and attended the #Meetovation training. These experiences introduced me to the city’s sustainable strategy, and showcased how local suppliers can support event professionals to get higher ROI on meetings by implementing the Danish Meeting Design. One year later I was back on a private visit to revisit favourite parts of the city. Three years on, and Copenhagen is still on the forefront of sustainability and creative Danish Meeting Design, with more new venues and developments to explore. Moreover, the city is more connected and everything just got closer. #everythingiscloser is the new campaign launched by Visit Denmark to showcase key elements that make it the perfect meeting destination. It’s a well-connected destination with progressive thinking with everything you need at your fingertips. We were one of the first ones to experience it first-hand and delighted to share it with you here. In this short period of time Kim and I spent there, we learned how meeting planners can benefit from the proximity of venues and ease of access. The trip was impeccably organised and coordinated, and everyone we met greeted us with great enthusiasm, showcasing their passion for the destination and the product or services they represent. Copenhagen’s well developed infrastructure made our short time in the city easy to navigate. We walked a lot, took an electric car, a harbour bus and the metro to visit all the venues and city districts. A great part of our trip was also about food, which I’ll elaborate in the next paragraphs. Copenhagen is a foodie paradise with Michelin-starred Danish restaurants and vibrant neighbourhoods, all within easy reach, where delegates will be spoiled for choice. And lastly, the Danish-mind set and progressive thinking, which I get to know better and better each time as I expand my network, can support event planners to add an innovative edge to their meetings. Event planners can draw inspiration from the design, architecture, sustainable solutions, entrepreneurship and the scientific clusters of Denmark. And now, let’s dive into the details of our busy 24 hours programme in Copenhagen. I took the train from Heidelberg to Copenhagen, while Kim flew-in from London. Flying would have been a faster and easier option for me too, but being in an advanced pregnancy stage I didn’t have a choice but to take the train. The journey wasn’t short for me, about 12.5 hours including a delay, but luckily on the way back it went smooth and took “only” 10.5 hours. Arriving late meant that we missed our dinner reservation at Nimb Gemyse, so our plans changed to have dinner at BOB, a 100% organic bistro in the trendy Meatpacking District. Only about 10 minutes’ walk from the train station, that was the perfect dinner choice to wind down after a long day of travel. We were hosted by AC Hotel Bella Sky. Boasting a unique and trendy design it’s a popular hotel for both business and leisure travellers and one of the biggest in the Nordic region. When we arrived, it was buzzing with tourists and congress attendees, being almost at its full occupancy. It’s a popular hotel for meetings and events, too. With 812 guest rooms and 48 meetings rooms, direct access to the Bella Center Copenhagen and proximity to the city centre and airport, it makes it very convenient for business travellers. Furthermore, the hotel has three restaurants and two bars, out of which I dined at the recently opened B A S A L T restaurant, but to this I’ll come later in the post. On this occasion we had to give the spa a miss, but the hotel has a wonderful spa, perfect for spending a relaxing evening before meetings the following day. In fact, this was my second time to stay at the AC Hotel Bella Sky. As previously mentioned, I was there for the Meetovation training and our group both stayed and held the sessions in one of the meeting rooms. For the second time I had the same room category, a corner suit, with a little office and floor to ceiling windows, both features I enjoyed very much. In this post, you’ll keep hearing about food as it was a great part of our day. One of the reasons is, that our AM programme was a gastro tour with Sine, one of the founders of CPH:COOL, a local company offering guided tours for groups around key interests. These range from architecture, over sustainability, design, cycling, gastro and more. Given our keen foodie interest, Kim and I went for the gastronomic option. Founded in 2005 by two locals passionate about their city, their focus is to showcase the hidden gems of Copenhagen off the beaten path, rather than the classic monuments and museums one can find in the tour guides. In just two hours we visited the local coffee shops and tried the traditional Danish specialties, like the cinnamon roll at Emmerys or the best open avocado sandwich at Café Atelier September. Just before finishing, we had a last stop at the organic hotdog stand called Hanegal. It was so delicious, eating another hotdog won’t be the same anymore. We finished our tour at Torvehallerne, the popular food market, but we couldn’t handle more of the food beautifully presented so just went for a healthy smoothie. It’s a favourite spot for locals, leisure tourists and business travellers. If you decide to book the market for groups, here is how it works: The delegates will get an amount of money to spend on lunch. They can place their food in the picnic basket they get from the organiser and can enjoy their lunch in the market or one of the green parks nearby. At the Market we were greeted by Mette from Visit Denmark to continue our trip with an electric BMW i3 provided by DriveNow to head to the northern part of Copenhagen, namely the North Harbour, for more discoveries. The first stop on our tour with the electric car was a recently opened venue The Krane and wow was what we said most being there. 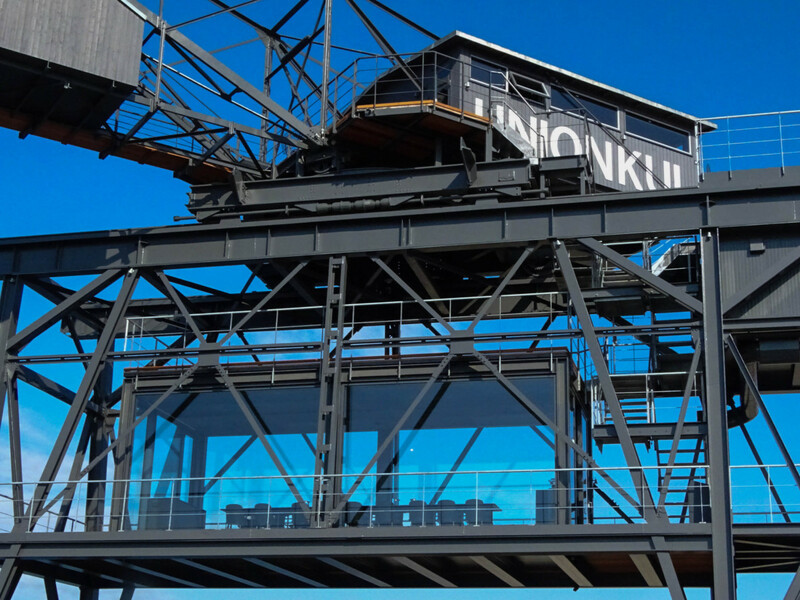 An old coal crane transformed into meeting space, spa and hotel left us mesmerized. The meeting room for 18, equipped with the newest technology, even USB ports in the tables, has four glass walls to get a 360° view of the surrounding harbour to enjoy during a coffee break. Climbing the crane up even higher is a hotel room for two, which can be used for smaller functions as well. A hotel isn’t a hotel without a spa and the crane is offering that too with private use for hotel guests. We enjoyed a little rest in the former driver’s cabin which is now a sun-lounge area before heading to the next location. The next stop took us even higher to see even more of the newest district of Copenhagen similar to the Docklands in London and the HafenCity in Hamburg. Copenhagen is known for its forwards thinking in sustainability, it is also a very active city, it’s part of Danish DNA as they say. Integrating an active element into your conference won’t be a problem anywhere in the city but to make it an experience this is the place to look for, Konditåget Lüders. An outside gym not anywhere but on the rooftop of a car park. Ditching the prosecco glass for trainers is the way to get onto rooftops in Copenhagen and with a 2,400 sqm space small and large groups have enough room to burn off some beans. After climbing all those stairs to be rewarded with stunning views we went up on yet another roof to be rewarded with some more food this time. Østergro is neither a rooftop bar nor gym but an urban garden run by a community. Locally sourced produce is the most environmentally friendly and urban gardens are the most local you can get in a city. This urban garden is also the home to chickens and a rabbit giving you the little farm feeling. Staying close to nature with a rustic feel you can have dinner in the green house for up to 20 people or a reception in between the kale and carrots with 60. During the harvest season touching and not just looking is allowed to get the vegetables out of the soil with a really different type of team building exercise. Having been on the ground and up in the air, it was time for us to discover another element and get on the water. In a harbour town sometimes the fastest way to get around is by boat and as easy as taking a bus on the road. Seeing the city from a different angle is an experience in itself but it is also carbon friendlier taking a public transport boat than a tourist filled sightseeing tour boat. We boarded the 991 boat at Toldboden North and wanted to go to our next venue next to Knipples Bro. That station wasn’t served that day which didn’t mean too much trouble as we just got off a few stops earlier and walked the rest while eating ice cream we got in Nyhaven. A delicious treat after all the healthy savoury options we had prior. The last stop we had before Kim had to get her plane back to London was one of the newest additions to the online meeting room booking platform gaest.com, Kulturtårnet, a former bridge tower. An incredible part of history that gets conserved by having found a different use. With a meeting room in the top floor holding 8 attendees and offering an outside space it’s the perfect spot for intimate but individual and creative sessions. Holding different art exhibitions in the bottom part of the tower there is always the option to get some exercise walking up and down the staircase and get inspiration from local artist. We managed to be there at the perfect time and enjoyed a sunset looking up and down the canal. From there we took yet another mean of transport, the metro, to get to the next venue, Crowne Plaza Copenhagen Towers, while Kim had to head back to the airport. Being the last stop for the day, we ran out of time to visit all the hotel conference rooms (there are 12 in total for up to 800 guests), but just enough to see another unique space that will surprise even the most savvy event professionals to find in a business hotel. The event space on the top floor is all “raw”, giving a feeling of being still under construction. But in fact that is on purpose, to ignite creativity and offer something different from the traditional corporate event space. Think of it as a blank canvas and let your creativity flow. This space is used only for special events and occasions and able to accommodate up to 150 guests. Some of the most popular uses of this space are fashion shows, for example. This hotel is conveniently located between the airport and the city centre, and next to Scandinavia’s largest shopping mall. Hotel’s Orango Coffee bar is a unique and trendy coffee shop committed to sustainability and offering small bites. It attracts mum meetups as well as business people “on the go”, all enjoying hotel’s advantageous location and cosiness. Another impressive event space is the 1,400 sqm Atrium with 60 trees and 4500 plants. The BARK Restaurant in the Atrium has a new concept I thought would be worth sharing with you, the doggy bag. Called “Fold me, fill me & take me home”, the modern doggy bag launched in September together with Unilever Food Solutions is about reducing food waste to ensure that people take food with them. The concept is more popular in some countries than others, especially not in the Nordic countries, so it’s a great initiative to encourage reducing food waste. From there I drove with Anne Marie from BC Hospitality Group back to AC Hotel Bella Sky to get ready for our dinner at the B A S A L T restaurant. But before that, I had a short meeting with a fellow Danish event blogger Anne I’ve been in contact with for the last two years or so but never met in person. It was great to finally meet her and chat about our mutual passion for events and blogging. Shortly afterwards I met Anne Marie again and was also joined by Kathrine from Visit Denmark for dinner. The restaurant opened over a year ago, and the Executive Sous-Chef Martin Nilsson-Møller and his team already accumulated national and international appraise for their concept. We dined there on Monday, and the restaurant was fully booked, with people queuing for a table so this must be for a good reason! The concept is yet simple but original, and based on a “humble celebration of fire and nature, offering a menu based on what fire can create”. All products are locally sourced and the menu changes with the season. Furthermore, key ingredients used in the dishes, such as the vinegar, honey and herbs are made in-house in their cellar. I choose leeks from the fire with mature cheese, thyme and burnt bread bouillon as a starter, and went for the salmon over fire sauce from grilled lovage. My colleagues went for the 5 course degustation menu and we all shared the traditional Danish brioche twirls served on coals chocolate and brown butter. Pure delight! And that was it for the most intense but amazing 24 hours in Copenhagen we could have imagined. That wasn’t my first time, but was yet a new and enriching experience to get inspired by the Danish creativity, sustainability, enthusiasm, happiness and see how close event planners can be to all necessary resources to host an event in Copenhagen. This trip was sponsored by Visit Copenhagen. You can learn more about the #everythingiscloser campaign and partners here.